While holding a swimming pool noodle in my hands, I realized that it represented an object that can be explored with children. Inflate the balloons. You will need several balloons since some will surely pop before children are tired of playing with them (supervision required). Use high-quality balloons. I didn't and balloons were popping left and right as they touched the grass. There is no need to buy expensive swimming noodles. I used swimming noodles purchased at the dollar store. They are also sold in stores like Canadian Tire and Walmart during the summer. Away from little fingers, cut each noodle in two. These shorter noodles are perfectly adapted for younger children. Since the noodles are light, playing with them is safe and simple. Playing with noodles and balloons encourages children to be physically active and helps them develop their agility. Of course, constant supervision is required since the balloons can (and will) pop. 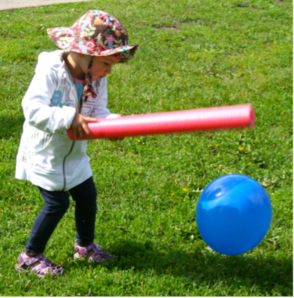 Give toddlers the opportunity to chase the balloons and encourage them to try to hit them with a noodle to make them move forward or in the direction of various targets. 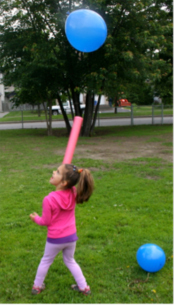 Activities involving swimming noodles and balloons can be done on grass or a harder surface such as a schoolyard. 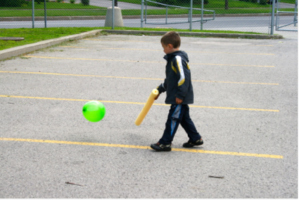 Keep in mind that less expensive balloons will be less likely to pop if they are played with on a smooth surface.